Trophy Chinook salmon are once again being caught at Lake Bullen Merri thanks to dedicated fisheries management in partnership with local anglers. Chinook salmon are one of the most prized recreational sport fish in the world and are renowned for their trophy size and exceptional fighting and eating qualities. VFA's Snobs Creek Hatchery holds the only stock of Chinook salmon in Australia, which is used to create put-and-take fisheries for the species. 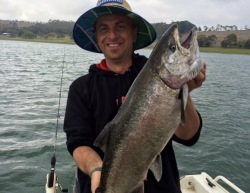 Trophy Chinook salmon over 10 pound are once again available to fishers at Lake Bullen Merri. Photo Source: Maz Stowlowksi. In the late 1970s, Chinook salmon stocked into Victoria's western district "Crater Lakes" (Lakes Bullen Merri and Purrumbete) reached 12 kg and attracted fishers from far and wide. Such was the popularity of this fishery that the Chinook salmon opening event in 1978 attracted around 5,000 anglers. In 2016, fishers have again caught trophy Chinook salmon to 5.6kg (12lb) and multiple specimens over 4.5kg (9lb). 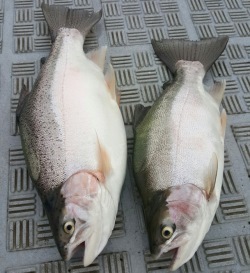 Good numbers of well-conditioned rainbow trout over 2kg are also being caught. The returning quality fishery is a result of significant efforts into recovering Chinook salmon fisheries over the past five years, particularly through improved fish production at Fisheries Victoria Snobs Creek Hatchery and science determining optimal numbers for stocking. Chinook salmon have been a popular angling species in Victoria's Crater Lakes for many years. Photo source Rick Maes. the purchase of new production equipment including incubators, chilling system, self-cleaning tanks and a filtration unit. Chinook salmon are prized by anglers for their strong fighting qualities. Photo source: Ben Bremer. This lead to a major increase in salmon production, fertilisation rates, survival and growth rates, however drought legacy meant that to rebuild the broodstock population at Snobs Creek Fish Hatchery, a gap in supply of fish for stocking would be required in 2015. The gap in supply was communicated to recreational fishers in forums, meetings and in Vic Fish Stock. Whilst there are no guarantees in fish production and Chinook salmon are particularly challenging to breed in Victoria's climate, it is expected that the anticipated gap in supply and rebuild of broodstock in 2015 will result in consistent production and supply for stocking in the future. Work by hatchery staff led to a major increase in salmon production, fertilisation rates, survival and growth rates. Well-conditioned rainbow trout have also been caught by anglers at Lake Bullen Merri in 2016 thanks to optimal stocking plans. Photo source: Ben Young. To design a stocking program that maximises returns for anglers in both numbers of fish caught and size of those fish, The Victorian Fisheries Authority worked closely with the freshwater fishing community to review the stocking history of Chinook salmon. Local angling club data, past fish population and angler creel surveys were used to develop a stocking plan for both Lakes Bullen Merri and Purrumbete. The stocking plan was presented to, discussed with and endorsed by recreational fishing representative groups. In November 2012, 11,000 Chinook salmon fingerlings were released into Lake Bullen Merri. 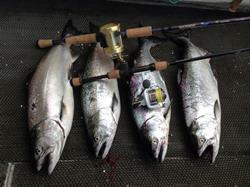 This was the first time Chinook salmon had been stocked into Victorian waters for five-years. 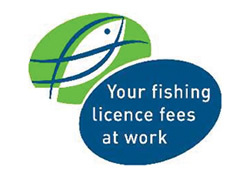 Local angling clubs have closely monitored the performance of the fishery since stocking recommenced thanks to funding from recreational fishing licence fees. 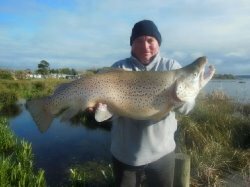 The stocking of brown trout has been prioritised at Lake Purrumbete. Photo source: Andrew Kompa. In 2015 fisheries managers met with freshwater anglers to consider the monitoring results that included a creel survey which had interviewed more than 1,100 anglers, and two years' worth of catch and effort statistics collected by members of the Lake Purrumbete and Camperdown Angling Clubs across both Lake Purrumbete and Bullen Merri. The review found stocked Chinook salmon had performed well in Lake Bullen Merri, with high catch rates by anglers and some specimens reaching large sizes. In nearby Lake Purrumbete, Chinook salmon had also delivered high catch rates for anglers but had not grown as large as hoped. Feedback from anglers at the review and via the creel survey had indicated a strong desire to maintain the high performance of the Chinook salmon fishery at Lake Bullen Merri and for increased stocking of brown trout in Lake Purrumbete. Consequently, stocking plans were adjusted for the lakes to optimise what each can deliver for freshwater anglers and to provide range of high quality trout and salmon fishing opportunities across both lakes. In 2016, Lake Bullen Merri will receive 20,000 Chinook salmon yearlings, 5,000 rainbow trout and 5,000 brown trout, while nearby Lake Purrumbete will receive 20,000 brown trout, 10,000 Chinook salmon and 5,000 rainbow trout. The Crater lakes are the only reliable waters in Victoria that are capable of supporting a high quality Chinook salmon fishery. 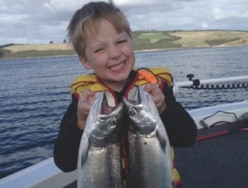 For this reason, particularly in Lake Bullen Merri, stocking plans have been designed to realise the unique growth potential of large Chinook salmon to the benefit of anglers. It is important to note that stocking plans for all stocked waters are reviewed annually at regional forums held in conjunction with angling representatives groups and water management agencies. Further information about fish stocking can be found on the Fish stocking page. The Victorian Fisheries Authority are delighted with the exceptional fishing at Bullen Merri as a result of fish production and science efforts in strong partnership with anglers. Fisheries Managers are always working on ways to maintain and continue to improve fishing at Bullen Merri and other waters around the state. One strategy currently being trialled for Lake Bullen Merri is to on-grow Chinook salmon quickly using temperature controlled recirculation technology and stock them after five, rather than 13 months after hatching. These fish may grow faster and consequently bigger for anglers to catch in the future. Stay tuned for results of the trial.